Do you wish to harvest more bell peppers this season? Pruning your plants could help. This gardening technique offers numerous benefits but only a few home gardeners use it. One reason is the lack of experience on how to prune pepper plants. This guide will teach you more about the benefits of pruning and when and how to do it. When to Prune Bell Peppers? But before that, it would be good to review some of the important points about pruning. Pruning is the process of removing dead or overgrown stems and branches to promote healthier growth of plants. Most plants including shrubs, trees and garden plants generally benefit from the different methods of pruning. Pruning keeps plants healthy and encourages them to grow better. However, pruning at the wrong time or doing it the wrong way may weaken a plant or cause damage to it. It could also cause the plant to bear fewer flowers and fruits. That is why timing is one of the important things you should consider before starting to prune your peppers. Whatever type of plant you need to prune, you will need the right tool to do it. A sharp clean tool will do your plant a favor and it will also help you finish the job faster. For pruning peppers, you will need a pair of sharp scissors or prune shears. · Pruning promotes stronger and sturdier stems. This gives the plant resistance to snapping during strong winds. · Pruning creates a bushier plant that encourages more side shoots and flowers for more harvests. It is said that removing the main growing tip of the pepper plant creates more side shoots and this is true for most varieties. · Depending on when you do it, pruning can help produce quality peppers or hasten the ripening process. If you leave them alone, bell peppers will continually grow new stems and leaves. Most of these growths will be upward, leaving the top part more vulnerable to snapping. All the energy available will then be distributed to these leaves than in the production of more fruits. Hence, pruning become necessary. During the first few weeks of growth, pepper plants generally develop three stems. HerbaZest recommends removing the weakest one when the stems are around a week old. You should then monitor the plant regularly and prune when necessary. Also, you need to remove any infected leaf as soon as you see one. Pruning before the bell pepper plant sets fruit can help improve the quality of your yield. This means bigger and better-quality peppers. It is believed that pruning at this time increases air circulation, allowing for equal distribution of nutrients in the entire plant. Moreover, it also allows the deeper parts of the plant to gain access to sunlight which is much needed in fruit production. However, many gardeners who tried pruning early in the season would attest that this process could be a trade-off between quality and quantity. It is important to note that you should only do early-season pruning when the plant is already at least a foot tall. Step 1. Hold the branch and carefully clip it off using scissors or pruning shears. To do this, follow a zigzag pattern up to the main stem. Cut every smaller and third branch out. This will enable you to remove one-third of the side shoots, enabling the main branch to get stronger as it receives more nutrients. Step 2. Remove shoots that are out of place. Pepper stems normally form a “Y” shape. However, there may be little branches that grow in between the Y. These are the branches that you also need to remove as they steal some of the nutrients that should otherwise go to the main branch and fruits. When doing this, be extra careful not to damage the main Y shape of the plant. The Y shape of pepper is its main backbone of the plant and any damage on it may badly affect the performance of the plant. Step 3. Cut the ripe peppers. If you can already see ripe fruits, remove them so that more peppers will grow in its place. Peppers come in different colors when they are ripe, depending on their variety. Be sure to check which variety you have. Moreover, if you have hot peppers like the habaneros and jalapenos, you could check on their corking or stress stripes on the fruits. This is a good sign that the pepper is ready for harvest. The purpose of pruning late in the season is to speed up the ripening of the fruits that are still attached to the plant. Late season pruning should be done a few weeks before the first frost will start. Step 1. Trim all branches. Using a pair of sharp pruning shears, carefully trim all the branches that do not bear fruit. This will ensure that all the budding fruits will receive the much-needed nutrients to mature. Step 2. Remove flowers and fruits that are too small. Check the plant for flowers and fruits that are too small or are damaged and have a lesser chance of surviving before the frost. Removing them will direct the plant nutrients to the remaining fruits and give them a boost. Check the pepper plant from time to time for new side shoots or unnecessary growths. While the fruits are growing, they require more nutrients to ripen. Any branch that does not bear fruit is considered bad competition for the plant nutrients and should be removed. 1. Give your peppers lots of sunlight. Pepper is one of the plants that grow their best when they receive the full sun’s rays. Whether planting in the garden or in the pots, make sure that your plants receive full exposure to the sun from morning to dusk. 2. Aside from sunlight, peppers also like warm weather. While we can’t control the temperature or the climate, it is best to plant peppers in the spring or when the ground temperature starts to warm up. Planting peppers when the soil is wet and cold can hinder their growth. 3. Boost the growth of your peppers with organic fertilizer. Peppers will benefit from getting organic fertilizer especially during their active growing season. One good example of organic fertilizers is worm castings which do not only offer plants with extra nutrients but also help them fight diseases. Peppers also grow best when they get consistent and adequate watering. Inconsistent watering will not only hinder their growth but can also cause these plants to develop rot. One way to ensure that your peppers receive consistent watering is through a drip irrigation system. Pruning offers numerous benefits to peppers. 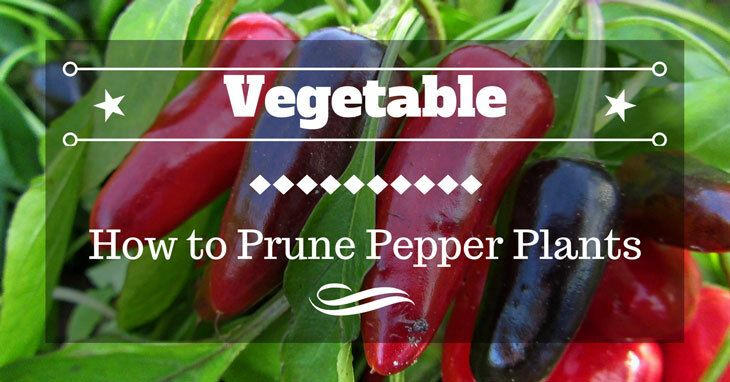 And depending on when you do it, pruning will either encourage quality peppers or promote more fruits. Pruning entails using the right tool and knowing when to do it. Our guide above should help you through the proper method and timing of pruning. Did you find this article helpful? If you do, please feel free to share it with your friends. Also, if you have some thoughts about how to prune pepper plants or you have some tips and tricks to share, you can do that through our comment section.